This Quick and Easy Dinner Rolls recipe will have hot fluffy rolls on the table for dinner in no time flat! Ever since the weather cooled and the leaves began to turn, I have been obsessed with baking. I seem to have been possessed by the spirit of Betty Crocker or something. It has been very strange. But whenever I start to think about what I want to get into the kitchen and make my mind goes to things like Pumpkin Cream Cheese Muffins, Mini Pumpkin Hand Pies, and Pumpkin Bubble Bread with Cream Cheese Glaze. Well, it seems I have been a bit pumpkin obsessed as well, but that is another story. I decided to tackle bread. Aahhh yes, the dreaded bread. Bread and I have not played nicely together. In my defense, I have tried very hard. Bread on the other hand. Well, let's just say that stubborn and persnickety just begin to scratch the surface. But, for whatever masochistic reasons, I decided to subject myself to the abuse and embarrassment that bread seems to dole out to me whenever I try to cross into its domain. I am determined, and a tad of a glutton for punishment at times. Just some of my little quirks. I have mentioned I am quirky right? Yes, I am quite quirktastic! I have decided that my big issue with bread is, my house is drafty. I mean like North Pole drafty. When it is cold outside I get a rip roarin' fire going in the fireplace and that seems to heat up every room but my kitchen, which seems to have a permanent polar vortex going on. It stays so cold that if I put butter out to "warm", ya umm it stays hard as a rock. Who needs a refrigerator? I could just put my food on the counters and it would be fine! Oh I know, I could put the bread by the fireplace to rise right? Nope, not me, epic fail every time! The one time I was able to get it to work was when I made Parker House Rolls with Sea Salt, and thank goodness for that because I had my son's girlfriend's entire family ( like 14 people) over for Thanksgiving that year. But I was determined to give it one last try, and hooorah I am soooo glad I did. Using the oven to get the dough to rise quickly was all I needed to do. Well I am sure millions of people knew, but I didn't, so yay me! I finally broke the bread curse! 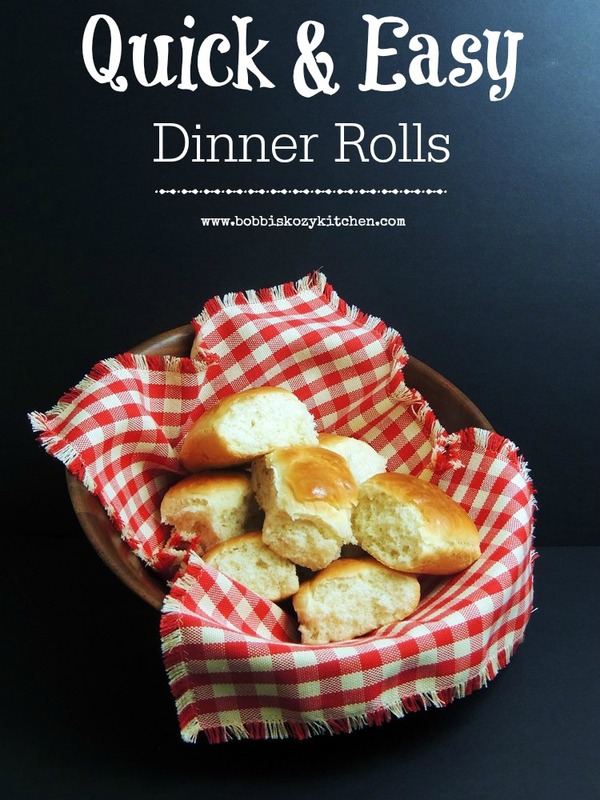 The whole family loved these rolls, and have requested that I make them again ASAP!. Preheat oven to 180 degrees F and butter a 13 x 9-inch pan. In a medium bowl, add water, milk, and butter. Heat in microwave on high until it reaches 115 degrees on a thermometer (about 1 minute 15 seconds). Stir to melt the butter. Pour approx 1/2 cup of the heated milk mixture into the bowl of a stand mixer and sprinkle in 1 tablespoon of the granulated sugar, stir until the sugar dissolves, 1 to 2 minutes. Carefully stir in the yeast. Let the yeast mixture sit for 10 minutes to bloom (the mixture should become foamy). Pour in remaining milk mixture. In a large bowl, whisk together 4 cups flour, remaining sugar, and salt. Cover bowl with a clean kitchen towel and rest 10 minutes. Turn dough out onto a lightly floured surface. Shape into an even, about 9 by 9-inches. Cut into 16 portions. Shape dough into 15 balls. Use excess dough (the 16th ball) to add to smaller rounds as needed, and place dough balls into the prepared baking dish. Dampen the tops of dough balls with the water (just so they don't dry while rising in the oven). place the rolls in the oven, close the door and turn oven off, allow rolls to rise 30 minutes (do not open the oven door). Remove from oven, then preheat oven to 375 degrees (should take about 5 minutes). Bake rolls for 15 minutes, or until tops are golden brown. Remove from oven and brush the tops of rolls with butter, just enough to coat. Serve warm. Yay, non bakers of the world UNITE!!! I always seem to have bad luck using active dry yeast, maybe I don't use it right. Maybe the water I use isn't hot enough? I did too so I researched and found out a few things. Check the expiration date of your yeast, mine was waaaaaaaaaaay over it. Yes, the temp of the water makes a big difference. I make sure it is warm, but not too hot to touch.